The key to financial stability is to spend less than you make while setting money aside for your future needs. People today are having trouble with both parts of that equation, spending more than they make in income and paying more in interest each month than they put away in a savings account. 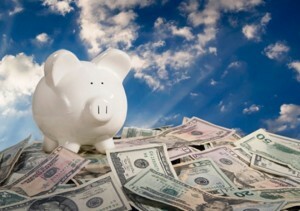 Fortunately, there are a number of strategies you can use to increase the amount that you are able to save each month. Here are some of my favorite smart strategies for increasing your savings. Saving money is much easier when you do not have to think about it. Automating your savings to occur as soon as you get paid will reduce the risks that you will forget to put the money into savings or that you will spend the money on something else. Many employers make automating your savings very easy by allowing you to direct-deposit your paycheck into several accounts according to your predetermined allocation percentages. If this is not an option with your employer, you may be able to schedule a transfer of the amount you want to save from your checking account to your savings account using the online features available on your bank’s website. Another way to quickly increase the amount of money in your savings account is to deposit any money you receive in addition to your regular paycheck into your savings account as soon as you receive it. This could include bonuses from work, tax refunds, lottery winnings, and monetary gifts. Because this money is not money that you regularly depend on, you can bank it without affecting your budget. You will be happy that you used this saving strategy when an unexpected expense occurs and you have the money to cover it. You can save more if you can reduce the amount you are spending each month on your regular expenses. Actively reduce your spending by considering the costs of everything you buy and evaluating whether it is worth the cost or whether the money would be put to better use being saved for the future. While at the grocery store, weigh which items must be name brand and which ones can be purchased as the cheaper store-brand variety. When choosing a place to eat lunch, choose based on cost as much as the taste of the food. There is a good chance that you will find many opportunities to reduce your spending during the course of a normal week. Automating payments is a great option. You can set yourself up for success by just scheduling everything to happen on time without even having to give it a second thought. I’m trying to reduce my spending every week, tracking my income and expenses is definitely a big help too. By automating your savings is a wise strategy.